Widely held rhetoric of the nineteenth century suggested to Americans that it was their divine right and responsibility to settle the West with Protestant democratic values. Newspaper editor Horace Greely, who coined the phrase “Go west, young man,” encouraged Americans to fulfill this dream. 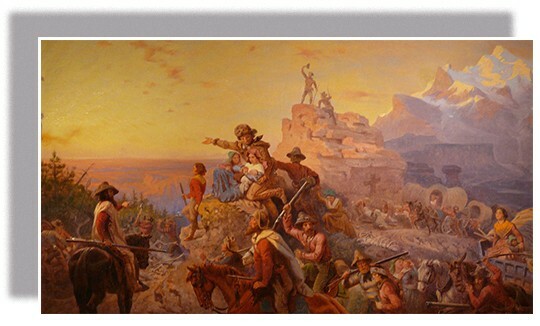 Artists of the day depicted this western expansion in idealized landscapes that bore little resemblance to the difficulties of life on the trail. In the middle of the nineteenth century, farmers in the “Old West”—the land across the Allegheny Mountains in Pennsylvania—began to hear about the opportunities to be found in the “New West.” They had long believed that the land west of the Mississippi was a great desert, unfit for human habitation. But now, the federal government was encouraging them to join the migratory stream westward to this unknown land. For a variety of reasons, Americans increasingly felt compelled to fulfill their “Manifest Destiny,” a phrase that came to mean that they were expected to spread across the land given to them by God and, most importantly, spread predominantly American values to the frontier. With great trepidation, hundreds, and then hundreds of thousands, of settlers packed their lives into wagons and set out, following the Oregon, California, and Santa Fe Trails, to seek a new life in the West. Some sought open lands and greater freedom to fulfill the democratic vision originally promoted by Thomas Jefferson and experienced by their ancestors. Others saw economic opportunity. Still others believed it was their job to spread the word of God to the “heathens” on the frontier. Whatever their motivation, the great migration was underway. The American pioneer spirit was born.